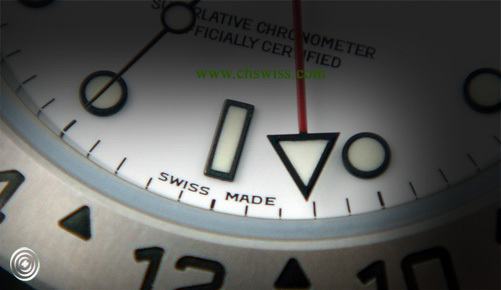 All watches manufactured in Switzerland are labelled as “Swiss made”, (often abbreviated to “Swiss”). A prestigious label of long-standing, it guarantees the highest quality in a timepiece, as well as certifying as legitimate its place of origin. “Swiss made” represents technical perfection in a watch, whether it be accuracy, reliability or impermeability. It also guarantees an aesthetic perfection of elegance and design, that combines manufacturing traditions with modern technology (such as micro-electronics). To protect the quality and value of the “Swiss made” watch from being damaged by counterfeits and imitations, the label must be protected in every watch market. FH ( Fédération de l’industrie horlogère Suisse) is an organisation that offers this protection. FH’s work involves monitoring counterfeiting in the watch market, as well as offering legal support in battles against the abuse of the “Swiss made” brand. In such cases, the laws of the country concerned are invoked, supported by an international agreement - (bilateral treaties signed by Switzerland and several European countries, leading to the multilateral convention known as the “International Organisation of Intellectual Property and the World Trade Organisation”). In order to set an example to other countries, Switzerland has enforced the laws available to them under Swiss jurisdiction. For example, the law approved in 1992, referring to the “protection of trademarks and place of origin”, introduced harsher legal penalties. The Swiss customs authorities, on their part, oversee all imports, exports, and goods in transit. In addition, a law has been passed that regulates the use of the label “Swiss made” by enforcing minimum standards that must be satisfied in order to earn this prestigious title. This law sets out how much of a watch must be made on Swiss territory. It also requires that 50% of a watch’s components must be manufactured in Switzerland. In Switzerland, some regions have their own brand label for the watches they produce. Among these, one of the most famous and most counterfeited, is the "Genève" brand. Identified with high-quality timepieces made in the city of Geneva, this brand benefits from the permanent protection of the FH anti-counterfeiting campaign.